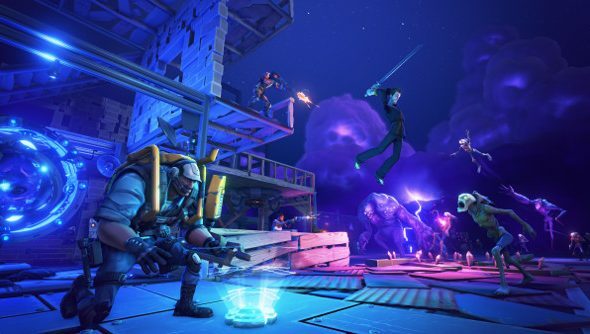 Like one of its fortresses, nobody was quite sure what shape Fortnite would take – not us, not Epic. But finally, the cartoon survival game which wore its Minecraft influence more proudly than any other big-budget game has wound up as a unique third-person tower defence affair. A game about pushing back waves of enemies purpose-built to tear down your house upon the rocks. Fortnite is delightful: a dedicated PC game due for closed alpha before the end of the year. It looks like this. The gathering phase of the game won’t be meditative like Minecraft – it’s subject to a timer, and you’ll need to collect a wide variety of materials to support not only your new walls and windows, but also the tools you’ll build them with and the weapons you’ll defend them with. I like best that wooden planks and glass panes clack and thwump rhythmically into place on top of your blueprints, falling around your feet and in front of your place. It’s the pure joy of impossible, instant engineering. Later on, the debt Fortnite owes to other third-person defence games is clear. Did you read our Jules’ Orcs Must Die! Unchained preview? Which game’s premise excites your inner pillow-fort builder more? Sign up for a chance at the alpha on the official Fortnite site. Epic plan to let a second wave of players at their defences in 2015.